Every chef knows that a quality chicken bouillon is an important and essential component of many dishes. Preciosa proudly offers high quality bouillons imported from Spain, and guaranteed to please. 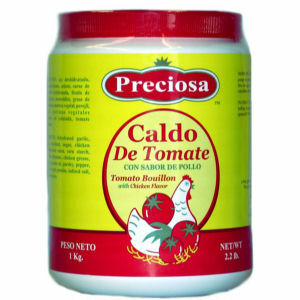 Preciosa chicken and tomato bouillon is a perfect ingredient for a large variety of delicious soups and wonderful recipes. Preciosa's one kilo size package offers a great value for restaurants and large families. Be sure to stock up on the entire variety of quality Preciosa bouillon products!